Across Canada, several big-city universities are building student residences through a variety of partnerships with private developers. University of Toronto environmental chemistry professor Scott Mabury said the spacious units and five-star amenities offered by privately owned, university-affiliated student residences like CampusOne in downtown Toronto are a far cry from the bunk beds, common bathrooms and cinder-block buildings that were the housing norm for students of his generation. But, he acknowledged that the plush new digs reflect modern living standards and expectations. They’re also a response to the acute need for Canadian universities in tight housing markets to deal with increasing enrolment and to compete globally. “This is all about attracting and retaining top talent – and not just students, but faculty and staff as well,” said Dr. Mabury, who is now in his second five-year term as U of T’s vice-president, university operations, and vice-provost, academic operations. Dr. Mabury was careful to point out, however, that U of T has no financial stake in the 890-bed CampusOne and that it’s not part of the university’s official student-housing plans. The university only provides food services to the year-old, off-campus residence, he said. “Funding in education is challenging and there is no government funding or philanthropy for student housing,” said Dr. Mabury. But, “where appropriate, we will partner with private developers to build residences in buildings that we own, operate and occupy.” He said the university estimates it needs 2,300 new beds by 2020 and is currently in a joint venture with a private developer, The Daniels Corp., to build a 511-bed residence downtown, which is scheduled for completion in 2021. “This is the first of what we hope is a number of residential projects,” he said. Students relax in a lounge at the CampusOne student residence in downtown Toronto. Photo by Knightstone Capital Management Inc.
U of T is not alone. 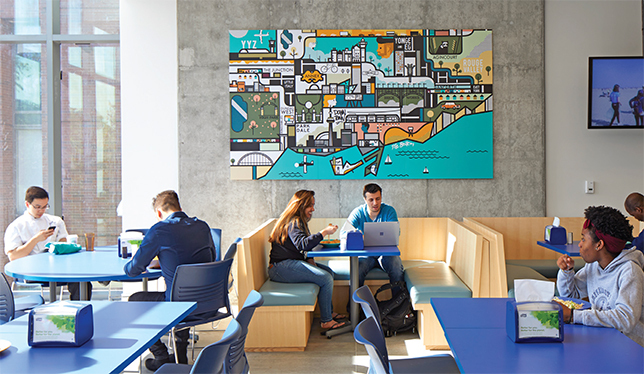 Across Canada, several big-city universities are either building or planning to build and operate high-quality student residences through a variety of partnerships with private real estate developers and builders. In Hamilton, McMaster University is in the advanced planning stages of its first off-campus student residence. The 12-storey project, which is intended to begin housing 1,400 first-year students in 2020, is a joint venture between the university and Knightstone Capital Management, a real estate development company that owns CampusOne and another 620-bed residence in a converted hotel in downtown Toronto, called Parkside, that caters to students at U of T, Ryerson University and OCAD University. Under the private-public partnership (P3), the new residence will be built by Knightstone on land owned by McMaster close to its campus in west-end Hamilton. The new residence will be managed by the university as part of its campus residence system, and students living there will be subject to the same codes of conduct and responsibilities as students living in an on-campus residence. A main driver for such partnerships, he added, is the growing interest of insurance companies, pension funds and private developers to invest in quality assets like student housing that provide stable sources of income and high returns on investment. Knightstone president Alan Perlis said his company is one of only a small number of Canadian developers focused on building high-quality, off-campus student residences – in partnership with neighbouring universities whenever possible – in large urban centres where rents and housing demands are highest. “The demand is huge and its widespread,” he said. According to brokerage firm SVN Rock Advisors of Burlington, Ontario, there is an unmet need of more than 400,000 beds for university students in Canada. Joshua Grondin, vice-president, university affairs, with the University of Toronto Students’ Union, said he understands why universities are turning to the private sector to help house students close to campus. But, he cautioned that administrators mustn’t lose sight of their duty to ensure safety, accessibility and affordability for what is essentially social housing. Marisa Albanese, senior director of student housing and hospitality services at McGill, said she too understands both the dynamics and growing popularity of high-end private student housing, which she characterizes as “more of a hot-topic issue in Ontario than here in Quebec.” Nevertheless, she said the many “shiny objects” they offer – everything from swimming pools to fitness centres and fireplace lounges – are meaningless if those residences fail to provide students with a sense of community. That knowledge, said Mr. Parr, is the impetus behind a proposal from UBC to create what’s called a government business enterprise named UBC Hospitality Trust that could borrow the money needed to build several new state-of-the-art student residences at more favourable rates. There is an urgent need, at the university’s two campuses in Vancouver and Kelowna, B.C., to build 6,300 new beds in the next 10 years to deal with long waitlists, he said. The university has already added 3,500 new beds since 2011, bringing UBC’s on-campus bed total at the two campuses to just under 13,500.